Ombre styling was first seen cascading down the tresses of Hollywood starlets like Drew Barrymore, Rachel Bilson and Lauren Conrad (here’s an awesome DIY hair ombre by Vanessa Vieira), and it has been implemented in many top designer collections like Prada and Chanel’s ombre eyeshadows. Since ombre-ing your hair requires a lot of upkeep and isn’t for everyone, there’s another way to ombre. So for those of us who are not oh-so-eager to jump on the ombre-d hair train (or have mothers who won’t let us), we can ombre our nails! 1. 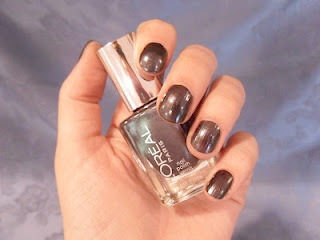 Pick two polishes, one dark and one light. Typically, the darker shade goes on the bottom of the nail, but there are no set rules here. I chose Essie's Turquoise & Caicos and L’Oreal Paris’ Raven’s Strength. 2. 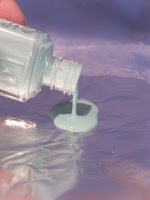 Paint two coats with the color you want on the bottom and let them dry completely. I chose to put the darker color on the bottom because I like the look of the dark-to-light fade. 3. Next, pour﻿ the two colors side-by-side on the piece of foil. 4. Press your sponge into the polish and then onto your nails one by one. The polish will get onto your fingers, but it does come off. 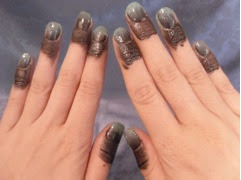 When I was finished, my fingers looked like they belonged to a Walking Dead zombie. 5. 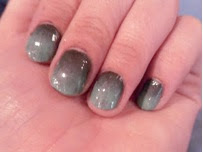 Wait for the polish to dry and use the Q-tips and cotton balls to remove the excess polish. Then, add a shiny topcoat. 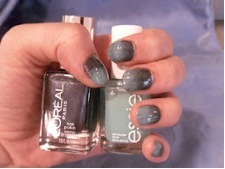 Some sponges create bubbles on your nails, but the topcoat smooths out the surface of the nail, creating an even look. This is such an easy way to try out the ombre trend without having to worry about the upkeep associated with ombre-ing your hair or the expense of buying trendy designer ombre pieces. Have fun and experiment with all your favorite colors for the summer!